That big box of wings will take you a good afternoon to unpack! All the bits are in there - very carefully and very thoroughly taped together. Here is the right wing laid out on the tables. each wing is 14' long. 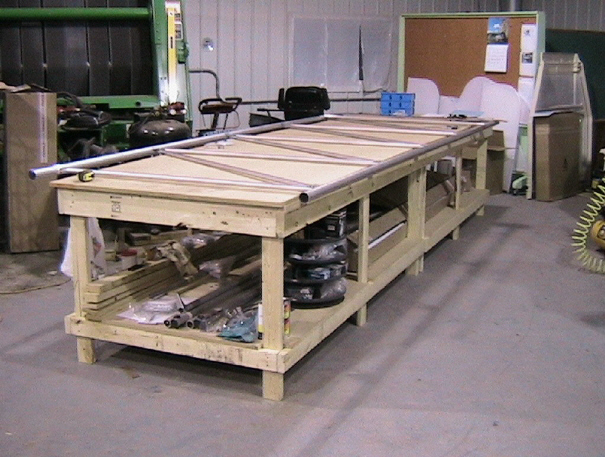 Now that I have a wing under construction, I'd build one table 12' long. 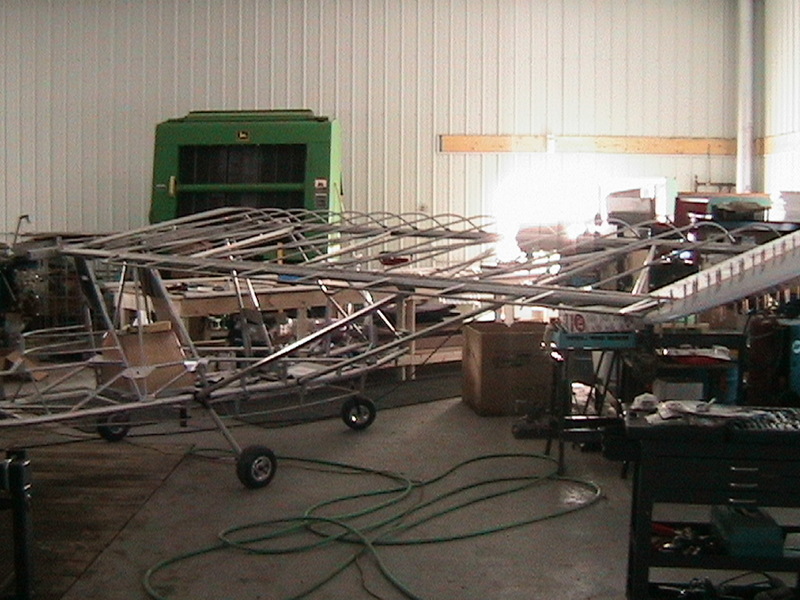 When you're working on the ends of the wings, before the ribs go on, 12' would allow the ends to hang over a bit and still sit level for attaching parts when the wings are upside down. Of course, a 12' table wouldn't hold the longer bits underneath out of the way, so wall brackets would be required. Things look much better without the wing box in the way. The ailerons also fit nicely under the table. 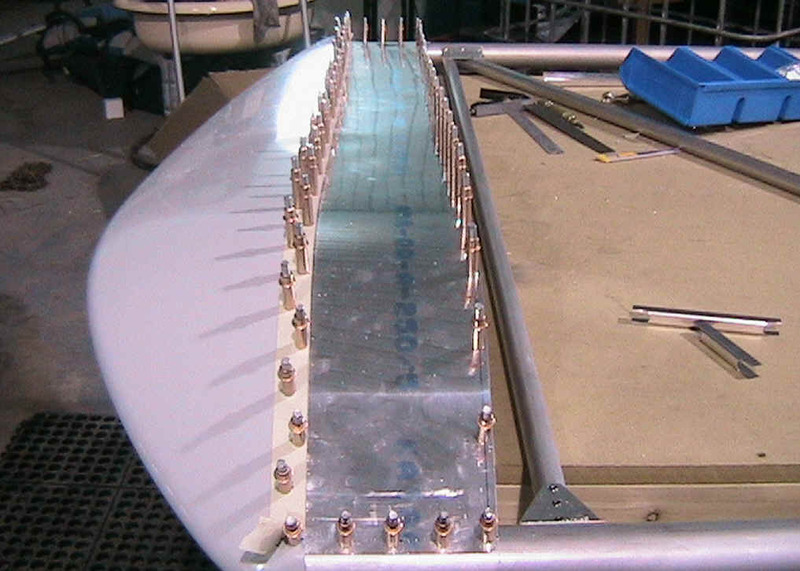 The first thing we did was the inboard wing ribs and flashing. 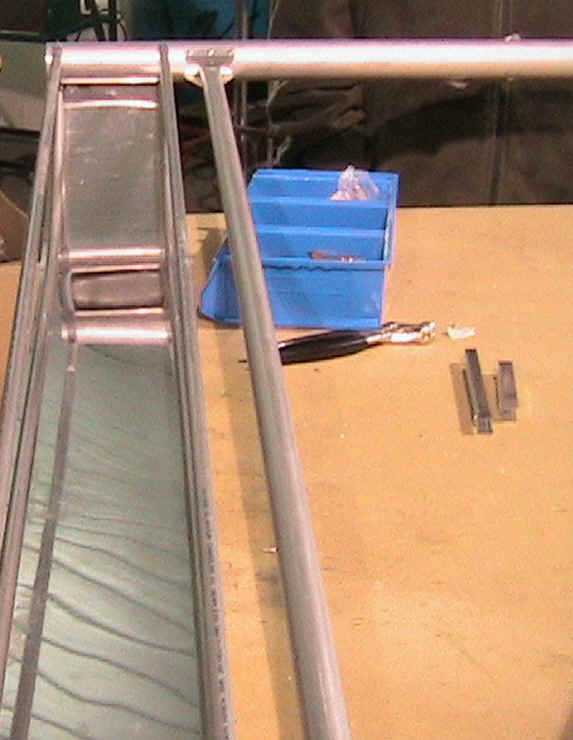 This 1.5" indent dimension is critical so that the wing will install to the fuselage properly. 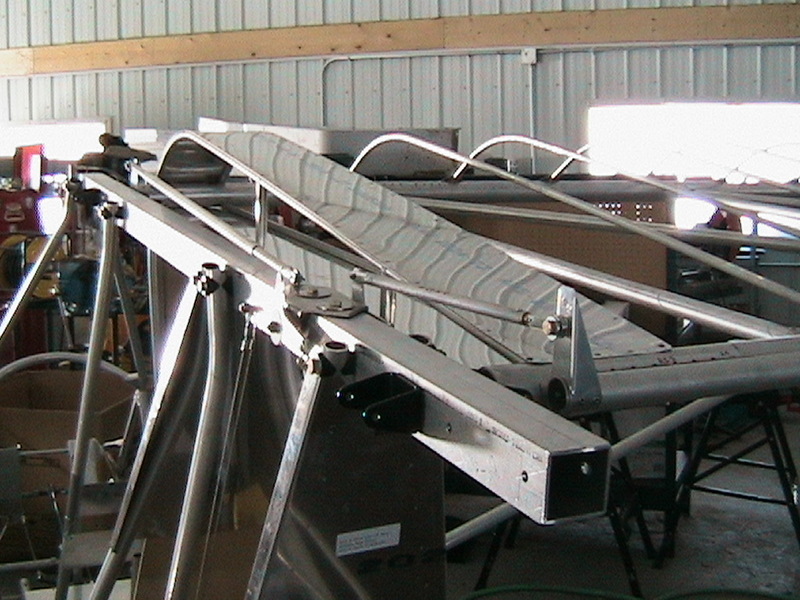 We installed the two inboard ribs and the bottom flashing first and then went to work on the top. 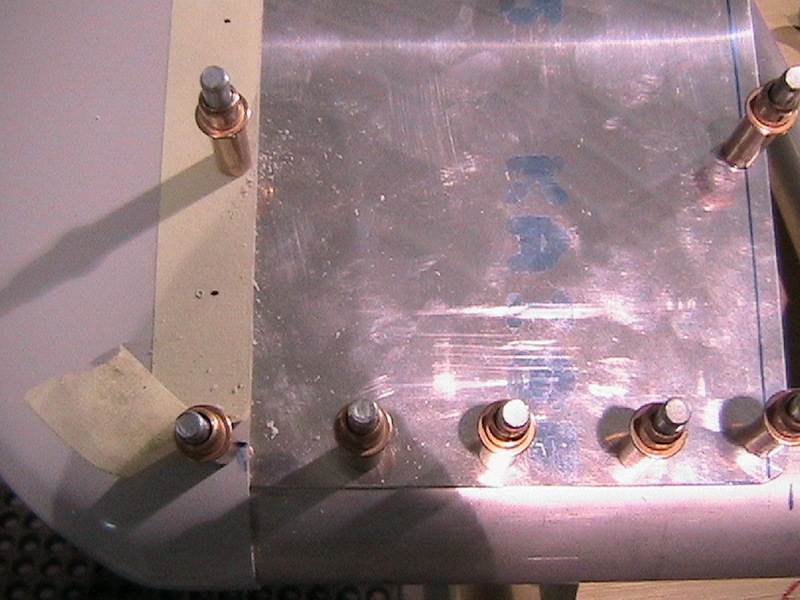 This was very straightforward and we have 150 or so clecos on hand so every hole was drilled and clamped before starting any riveting. I neglected to take too many photos of that whole operation, so will try to do a better job of documenting the rest of the right wing! 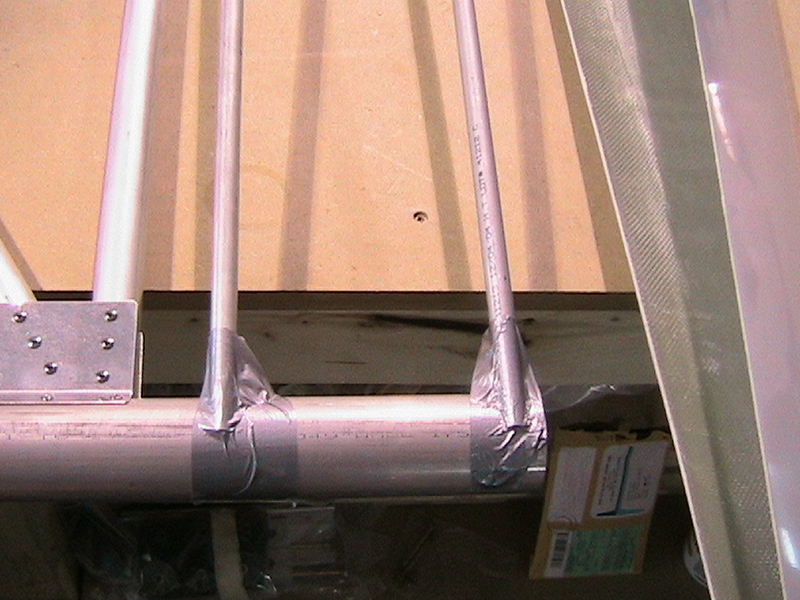 Duct Tape and Clecos- you can never have enough of either!. I'm up to a couple of hundred of the latter (just in the 1/8 size) and that's probably still not enough. Best price I've found is Aircraft Spruce. I wish I had ordered more since coming into Canada Customs charges make small orders less cost-effective. They charge about $0.40 (USD) each. They're available locally in Edmonton at Goulet Aircraft Supply as well for a bit more. 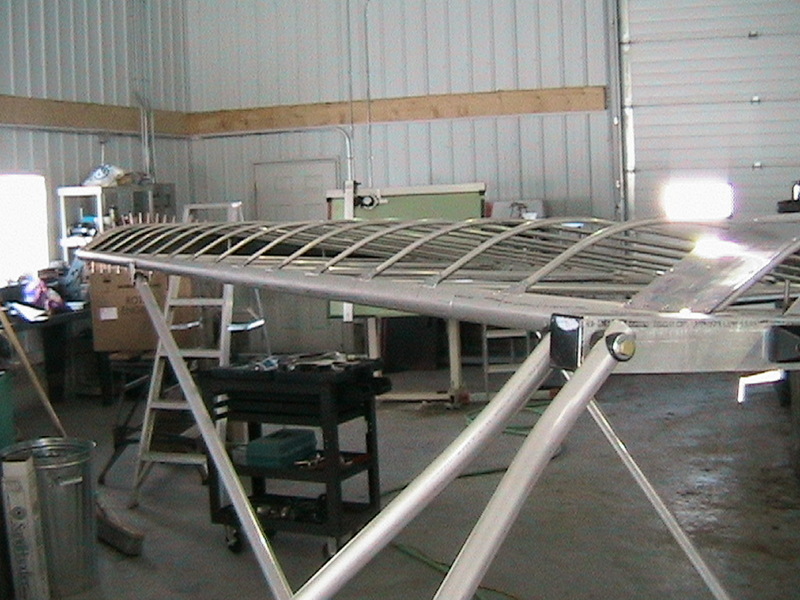 Anyways here I've temporarily attached the outer upper wing ribs for fitting and marking. I decided to do the upper wing surface first to check out the fit of the fiberglass wing tips (a very nice looking option). Web research was not conclusive (all manner of approaches were discovered! 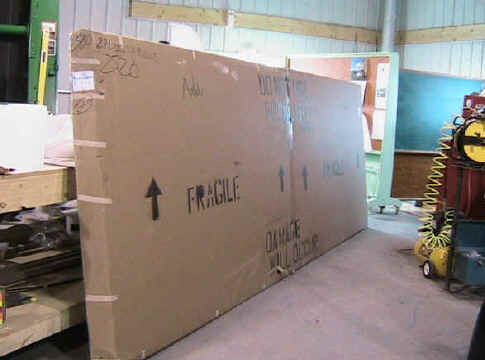 ), so I talked to the Quad City factory and then to a very helpful builder in Niagra Falls, Ont. named Dave Allan. The pictures show what I've ended up doing. The inboard rib is simple. 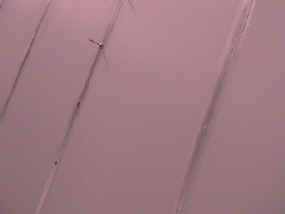 I drew a line 1/4" in to align to the middle of the inboard rib. For the outside rib, I drew a line 3/4" in to align with the outside of the rib and then made marks for the rivet holes 1/4: further in - which put me in the middle of the outboard rib. Notice the nice neat corners on that flashing. I've started pre-sanding all possible parts to make taping easier later on. Only Draw with FELT PENS (I use "Sharpies") NEVER use pencils. 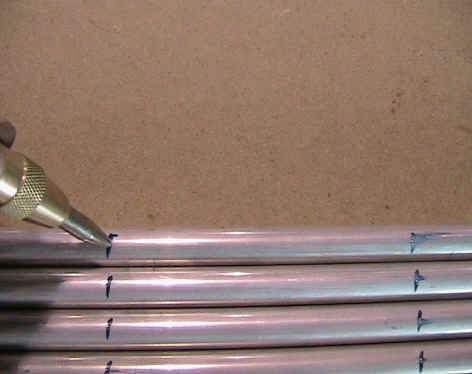 Something in pencils reacts badly with aluminum and starts corrosion in a nice straight line right where you draw it. A nice straight line of corrosion make great places for things to snap off later on. I learned this from a Rotax Canada rep at a very helpful clinic at a Challenger Fly-in in Montebello, Quebec. For those of you following along on the wing tips - note that the 3/4 inch line in the photo is the OUTSIDE of the rib underneath. 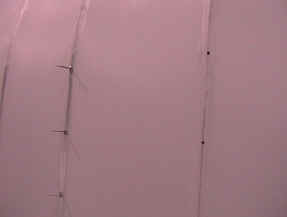 I'll get photos up here soon that show the other line of rivets holding the flashing to this rib! Something else that's a MUST-BUY- an automatic center punch. About $5.00 at Princess Auto. They are way better for building precise things than a hammer and punch. Basically you just press and a spring hammer inside the thing makes a nice neat dimple for drilling.. Here you can see me making nice dimples every 3" over top of the inboard wing rib. Now, for the outer rib, I did two things. I laid out a strip of masking tape on a very long ruler and marked off every 1.5". 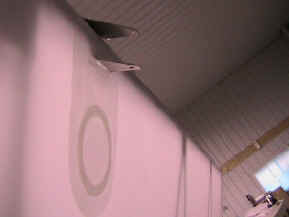 I then transferred the tape to the wing tip (which is curved on top - hence measuring off on a straight-edge first). 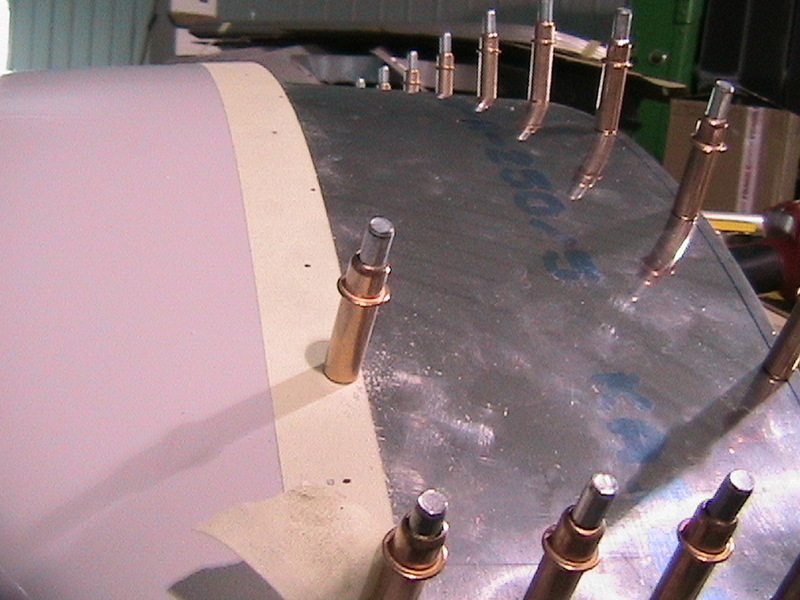 I drilled and cleco'd the wingtip in a couple of spots, and then set to work doing some very precise marking. 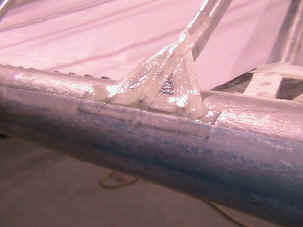 Basically, I drill through the fiberglass tip and metal flashing every 3". I catch just the fiberglass tip and the flashing every alternate 3" up to the top of the chord of the wing, and then every 6" on the flat part of the wing. 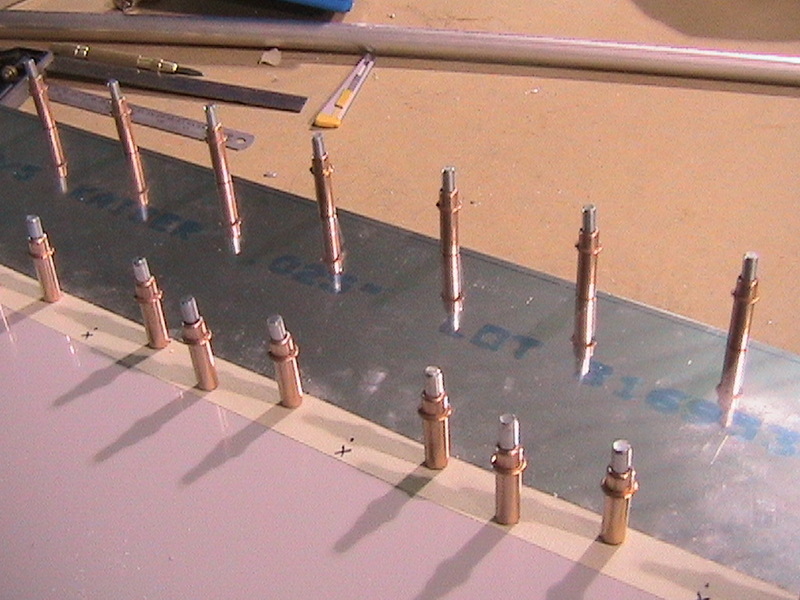 I am not riveting the fiberglass tips on at this point - clecos only. After I cover the wing, I will melt through the fabric to each hole with a pencil tip soldering iron, and then replace the fiberglass wingtips OVER TOP of the fabric and rivet them on. 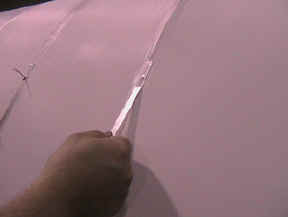 Finishing tape will be used to smooth the rise between the wing tips and the covered wings. In the event I ever get some hanger rash n the tips, replacement will be much easier than having to re cover the wingtips. In the last two photos you can see the completed right wing tip and the VERY CAREFULLY sanded and fitted fill plate provided to form a smooth surface at the end of the wing tip where the aileron sits. 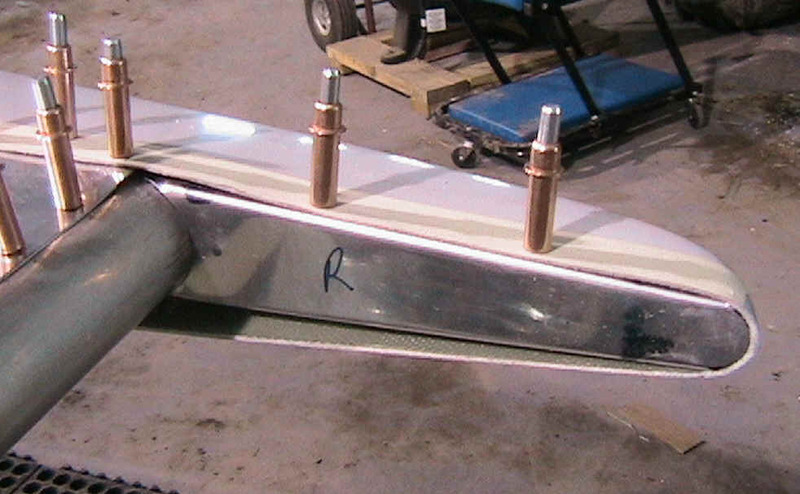 What isn't obvious in the above photos is the other line of rivets that join the metal flashing to the outboard rib. I did this later on after I moved the rib in where it belonged! Here I've turned the wing over and am starting on the bottom of the outboard wing tip. Having done it a few times, flipping a wing over is actually a one person job - you just need to get yourself into the middle of the wing! Now onto the wing ribs. 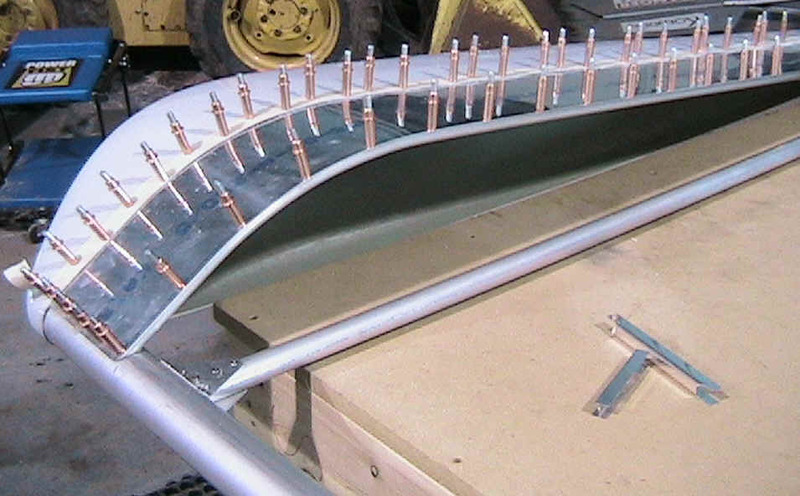 You need to drill holes about every 4" on the flat part of the wing ribs. These are used later to insert large head rivets through the fabric once it's on. They are way easier to drill now to get a nice finish than later when the fabric is on and the chance of error goes up! I taped them together with the ends all butted up nice and square against a level. I used a small T-Square to mark off every 4" across all the ribs. And then out comes the trust automatic centre punch. 14 ribs * 11 holes - that's 154 holes! Point 1 - use V-Blocks. You can get these anywhere they sell metal working tools (House of tools, Princess Auto, Busy Bee etc.) A decent set is about $30-$50. 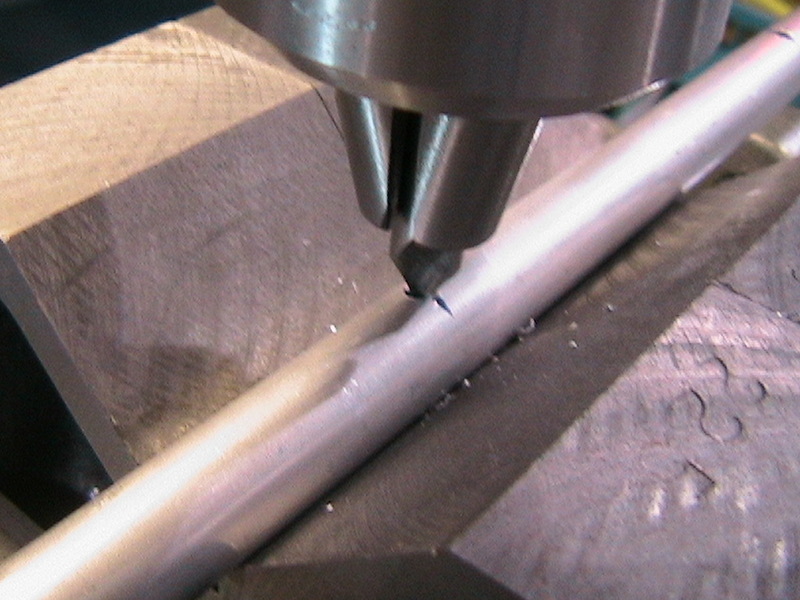 Invaluable for drilling round parts. You can make a decent V block out of a piece of square hardwood at least 2" x 2" if you have access to a router or shaper with a 90 degree bit (45 degrees on each wing). 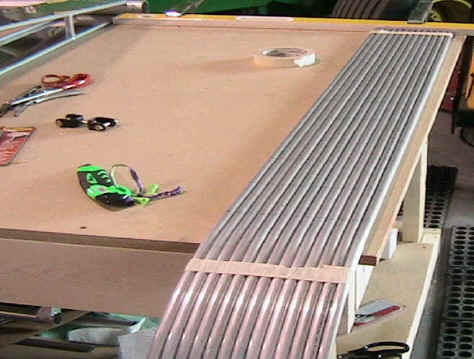 You could also notch one out with a table saw if you can tilt your table a precisely 45 degrees. A friend with a Shopsmith could accomplish this for you. 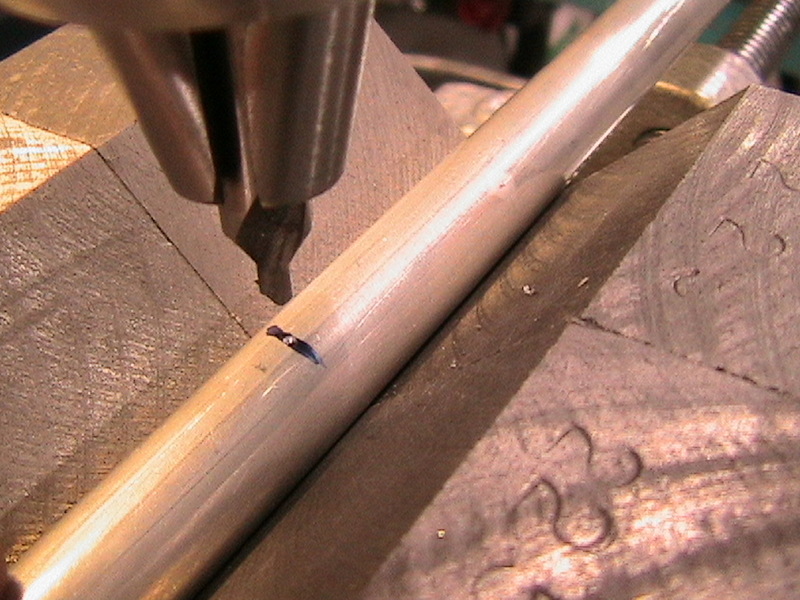 Point 2 - A Center Drill (1/4" in this case). 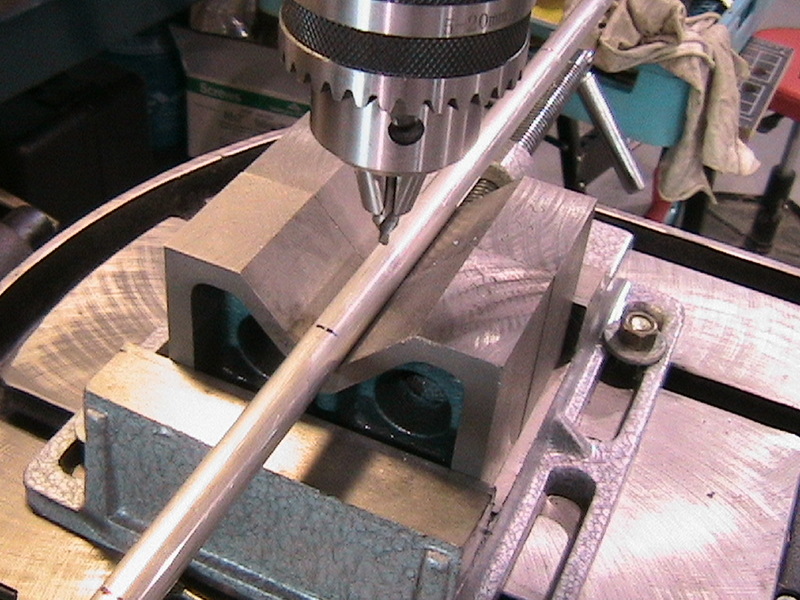 Normally used for drilling holes for lathe centers into the end of a piece of shafting. These are very hard and will not run off the rib. 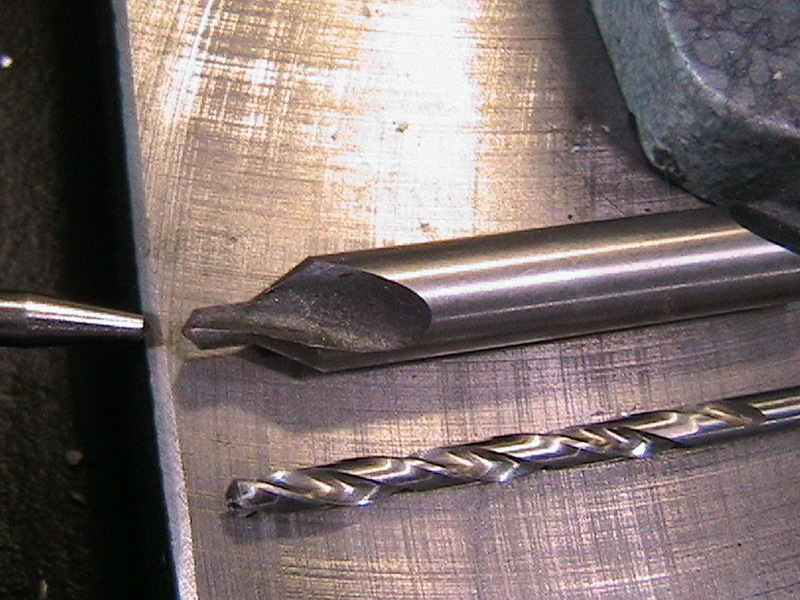 A 1/8" drill bit is very thin, and prone to wander - you can see the difference in the second photo. Small center drills like this (1/4") are fairly cheap (less than $10 - same suppliers as above) and the end of this one just happens to be 1/8". Careful when using it though, if you try and drill past the little nib on the end, you'll start opening up the hole to the larger diameter of the centre drill! 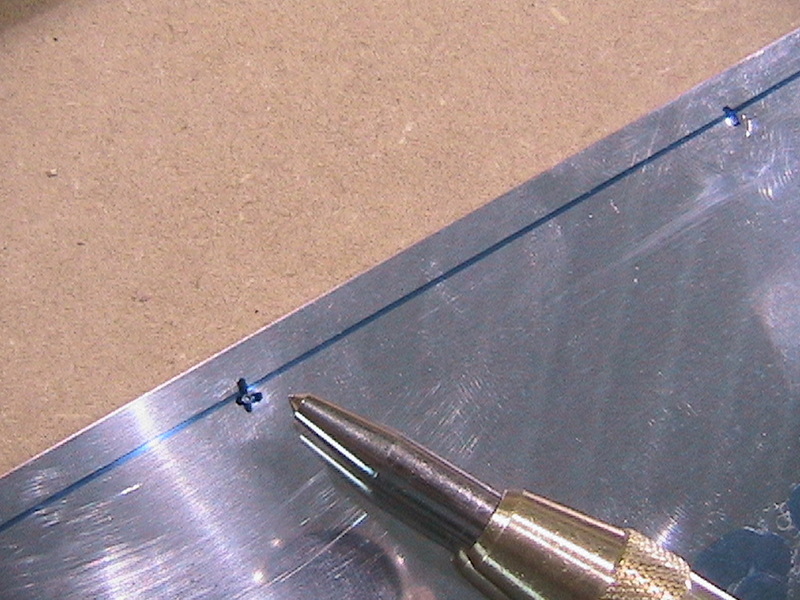 Make sure you get one where the first drill step is 0.125" or 1/8"! Remember not to drill past the 1/8" part of the centre drill. You'll get a very nice counter sink and deburring of the hole, but also a larger hole - which is not what we want for 1/8" rivets! I found I was having real problems trying to ensure I had the aileron travel suggested in the manual with the wing on a flat table. And since I had to install aileron pushrods and the flaperon assembly anyways, I decided to just install the right wing temporarily and see how things were working. The first picture shows a right wing on a plane. You can see the build table in the background. 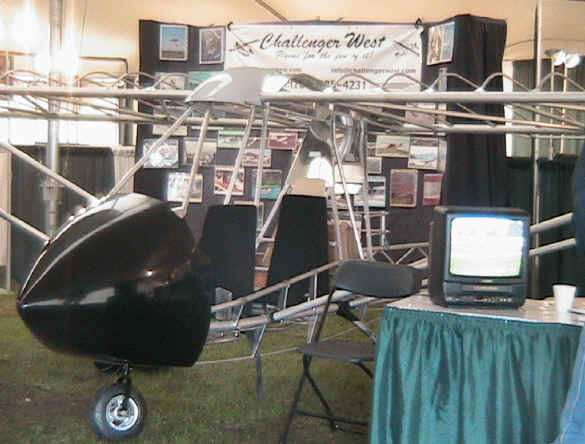 You might also notice the shapely 15 gallon fuel tank from Turbulence Aviation in the fuselage. I've not finished installing it yet, but it is sitting in it's rightful place. I took the plunge and got a fancy fuel computer with the tank and a heater kit as well as I plan to set some Western Canadian Winter distance records in this bird some day soon. 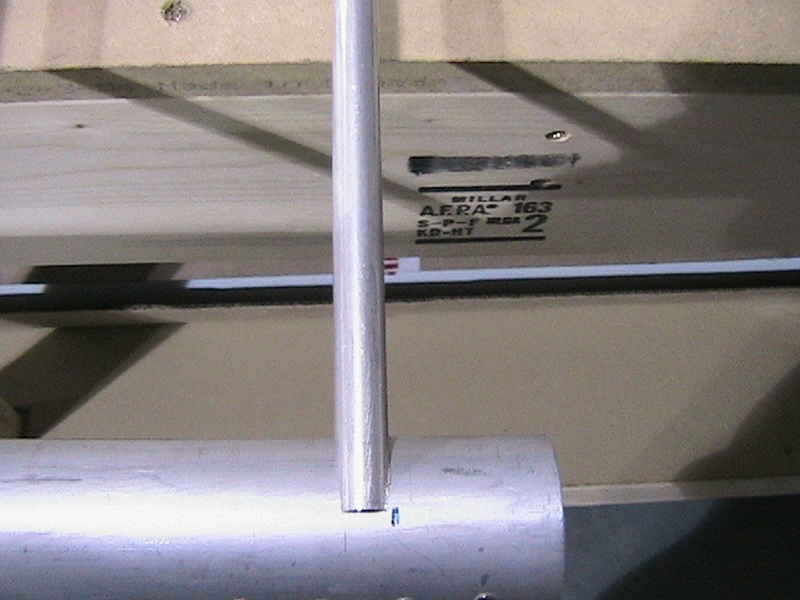 The second two pictures show close-ups of the aileron and flaperon push rods. I managed to really screw up the aileron push rod to the point where it was about an inch too short. This was my mistake as I did not measure twice and cut once! I was a bit impatient and had the clevis fork wedged in to the push-rod. I think it was just the heat of my hands expanding the metal at different rates, but it got severely wedged and I finally ended up turning it off in my lathe. I had, of course, bent the thing, so it got scored pretty good and was quickly deemed unsuitable. 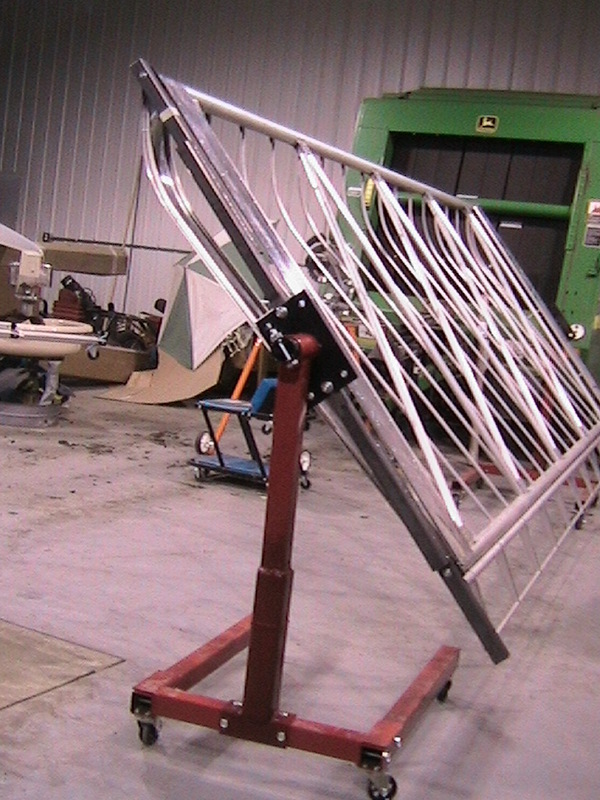 Hark, no problem is too big to solve when you have such a supportive manufacturer. 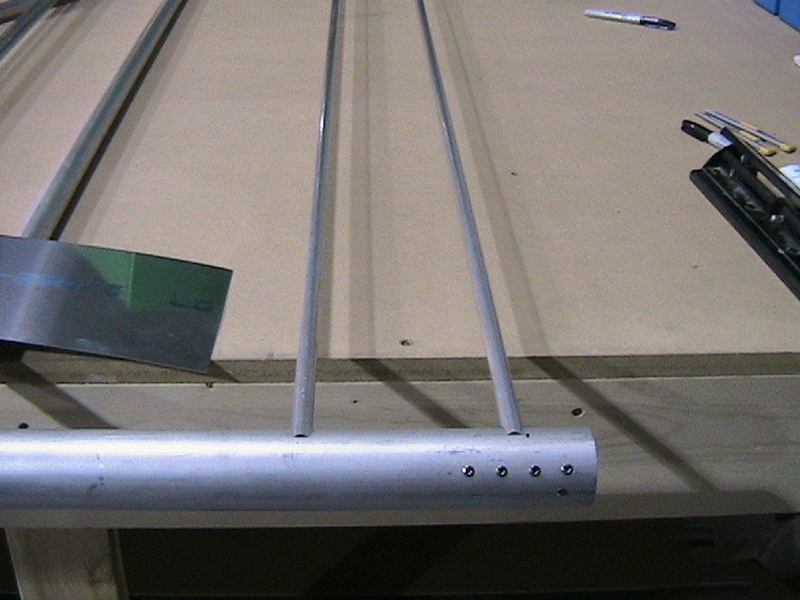 While I was a bit upset with myself, a quick call to Quad City had a new piece of aileron tubing (4 feet of it in case my tape measure ever fails me again!) and a new clevis fork in the mail. Total cost was about $15 U.S. and it was here all the way up in Canada in a few days. 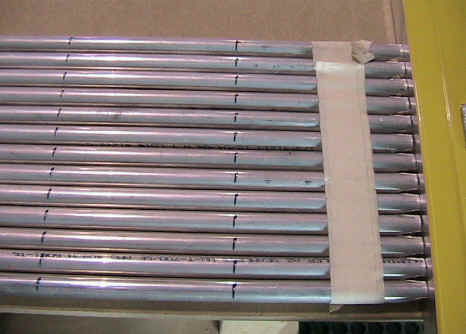 I would have normally sourced the tubing here at my favourite "Metal Supermarkets", but the aileron pushrods are a thin walled tubing that is tough to source in small quantities (Minimum order 120'), so I was pretty happy when QC said they'd sell me as much or as little as I needed. Anyways, everything is now installed properly. 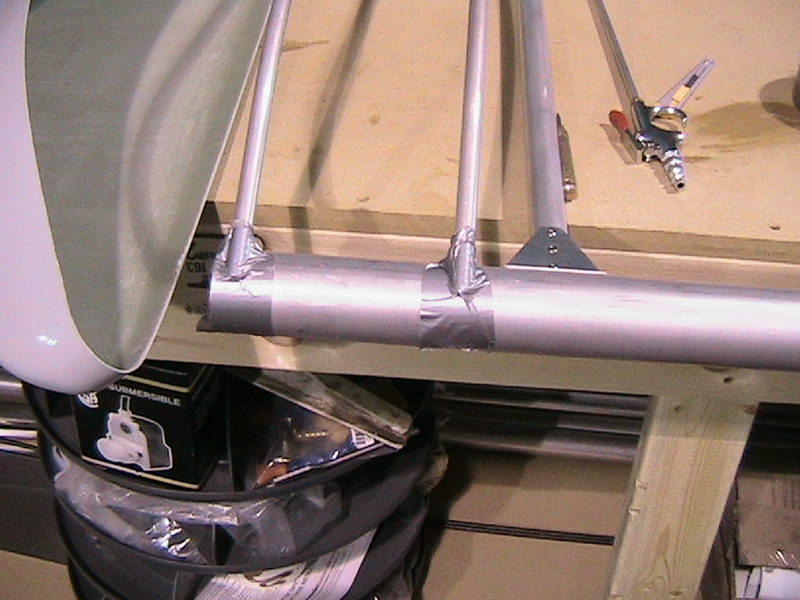 My basic problem was I installed the middle aileron hinges a wee bit high. 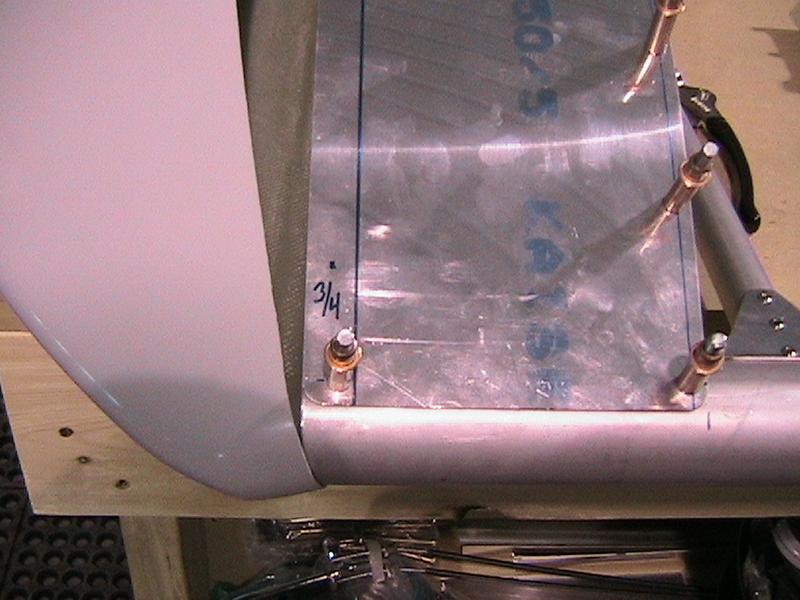 I believe it is essential to measure the aileron hinge height as the very first step in building a wing so the magic 1/8" mark called for in the manual is exactly where it belongs. By the time you add the wing boxes and rivets, you are adding height to the bottom of the wing, and even with a surface gauge, I got it messed up just enough to have the middle hinges up too high. 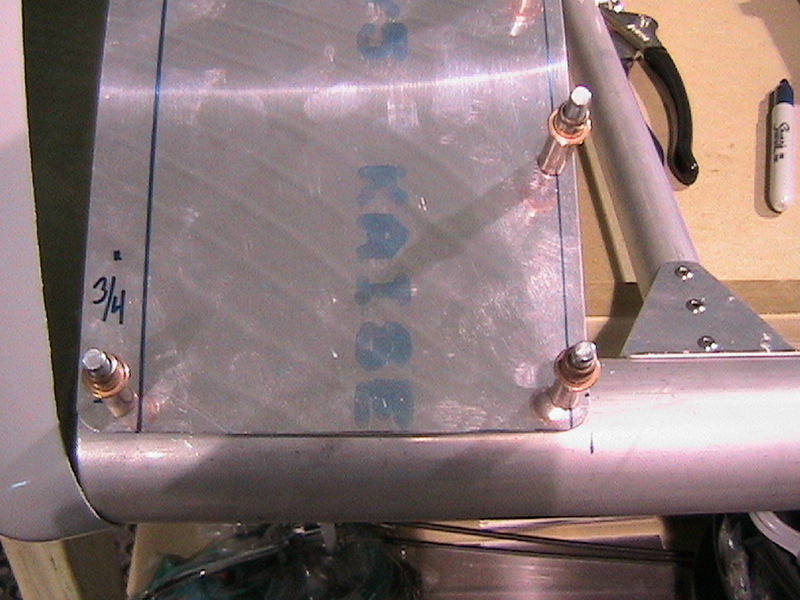 This introduced a slight upward bow in the aileron and this tended to limit hinge travel below specs. I undid the middle hinges and now have oodles of aileron (and flaperon) travel. A call to QC suggested I just move the 2 offending hinges a wee bit either way and fill the holes with stainless rivets which is what I am going to do on the right wing. 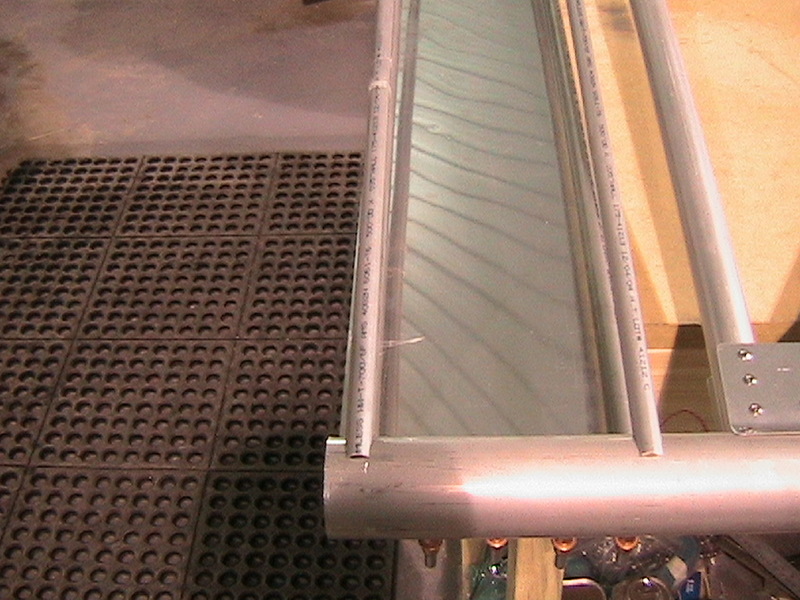 The spars are double walled in this area, so there is no real issue with weakness from a few extra tiny holes. We had a great showing at COPA in Wetaskiwin in June. Met a lot of folks, including several Challenger Owners and even helped enable a few new ones! Mom and Dad came out for a few hours and wandered around. I recall Dad was too tired to walk too far to look at the other group of Challengers that flew in - I guess the signs are always there if you notice them. I got really busy with a lot of things just after the COPA Convention. In addition to spending much time farming, 4H functions, and (of course) work, I had decided that I had too many projects on the go at once, and had to drop tools for a bit and hunker down to finish my Private Pilot's License (now complete), so building my Challenger had to take a back seat for a couple of months. We had an awful setback in July when my Dad, Lloyd, became ill. After a heart attack in mid-July, Dad had planned bypass surgery in early August, but suffered a series of strokes during and after his operation. He never really fully regained consciousness, and passed away on September 14, 2005. Though we all miss him terribly, we know Dad is in a better place now than when he left us, with a perfect, brilliant sky, severe VFR, and favourable winds. Dad would not want us to dwell on the past and on what is done. I am happy that Dad came flying with me and my instructor while I was doing my Private Pilot's license, but very sad that he can't take the controls of our Challenger. It was my Dad who encouraged me to just go for it and build this dealership when we discovered an airplane we could afford to fly for fun called a Challenger II. Losing Dad has obviously set us back on our build schedule, but we are working away on the plane, albeit more slowly than when he was here to help. There are days when I don't know who to talk to because Dad isn't here anymore, so I just "think to him". When my Challenger is done, Mom and I will take Dad's ashes and fly way up high, out into the foothills, or maybe just high above the farm, or maybe way up above many of our favourite places that we shared as a family. We'll shut off the engine and listen to the wind, and than set him free on a breeze so he he can fly forever. Back hard at it in October, I finished the apparatus I had decided to build last summer to assist with the "swinging of wings" and fuselages. As I plan to build several more Challengers over the coming years, I decided to take some time and build a proper jig. This came out of some lengths of tubing and two $60 engine stands from House of Tools . We can now swing a wing 360 degrees (with one finger!) 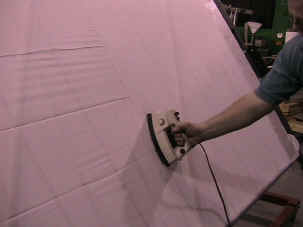 for taping, covering, poly brushing, painting and striping, etc. I will be adding some strapping between the stands for rigidity before moving anything as I don't want to risk twisting a wing. This device turned out to be a lot more work than I thought, but now that it's done, I think it will prove useful in our own builds/painting and for our Customers. 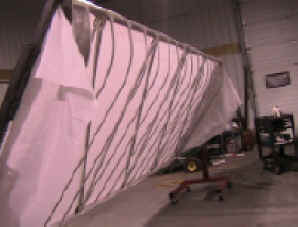 It is designed so that an entire wing, complete with ailerons can be swung freely all the way around. In the first photo, you can see the leading edge bottom fabric glued down nice and tight. It is partially covering the taping that was applied to the rib gussets - we don't want any sharp edges against the fabric. Prior to gluing the fabric on, the wing was sanded wherever fabric would touch, then sharp edges taped, and finally a couple of coats of Polytack glue, were applied to provide a base for the fabric to set into. Photo 2 has the bottom fabric draped and glued on both leading and trailing edges - ready for stretching. I got this little Infrared Thermometer for $40 at a local hobby store - used for covering RC planes. Works great. Note that the iron temperature varies a lot from one spot to the next and moving the thermometer a half an inch left or right might yield 20 degrees variance. The thermometer picks up even a degree of fluctuation. Next is the fabric just before ironing. The rest of the photos show the iron doing the first pass at between 250 and 300 degrees. 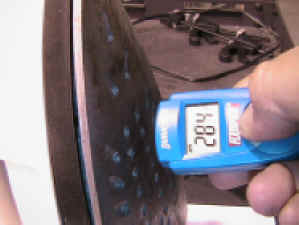 The iron loses temperature to the fabric, so I tend to take it off every couple of minutes and let it regain the temperature and then check it with the thermometer. This is a piece of cake! I ended up going up to about 340 on this wing. Now that is the max temp I read anywhere on the iron, Some places were lower by up to 30 degrees. The trick with Polyfibre is NOT to go ABOVE 350. 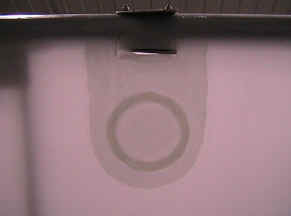 After that the fabric permanently loosens. 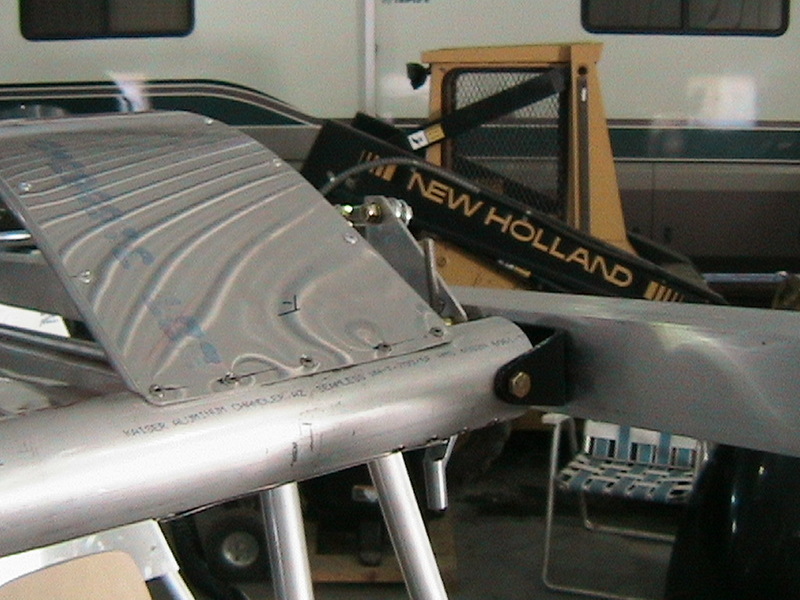 Here's a photo of the bottom of my wing where I have installed inspection plates so Ii can get at the wing strut brackets. they aren't all that pretty, but they will work real good. I may re-attach nicer looking doilies over the plates before I get at the Polybrush - just cause I'm fussy! Most builders just make little slits and put the strut nuts on with a wrench with some tape to hold the nut. I originally thought these inspection plates would be a good idea, but I'll probably remove them before I paint. I've seen a hundred or more Challengers and all of them just have a little hole to attach/inspect the strut bracket bolts and nuts, so I think that'll be good enough for me as well. A rag and some MEK, and these inspection plates and covers will be gone. Please note my strut bolts are backwards in these photos (they're just on here temporarily). Nuts to the inside - just on the wings though. Nuts to the rear everywhere else! 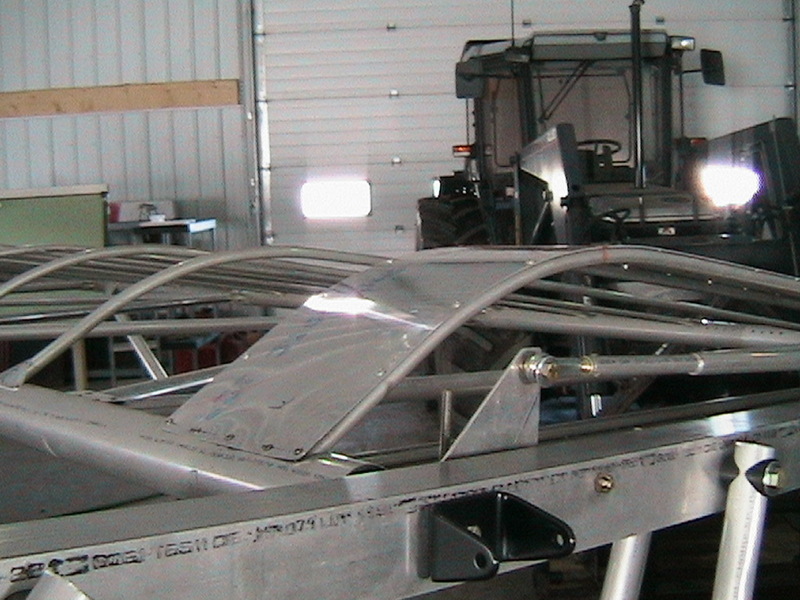 Here is the top of a wing. If you recall all those holes we drilled in the wing ribs, here I am melting the fabric with a pencil soldering iron so I can put install the fabric rivets. Melt the holes, install the polyester reinforcing tape, melt the hole through again, insert the rivet, set the rivet ... repeat about 156 times! 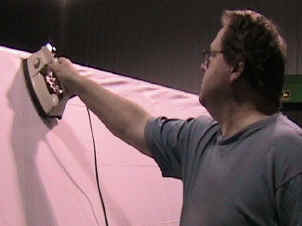 That things that looks like a plastic bag on the air riveter ... it is! These things spray out a bit of oil with each rivet, and the bag keeps the oil off the fabric. You can do it this way, or scrub like hell with Mek. The bag is less work! I've since replaced my Princess Auto pneumatic rivetter with a much nicer one made by Pop of Pop Rivet fame. I got it at Accufast in Edmonton. Pricey, but a magnificent tool! Both wings are finally done and awaiting Polybrush. 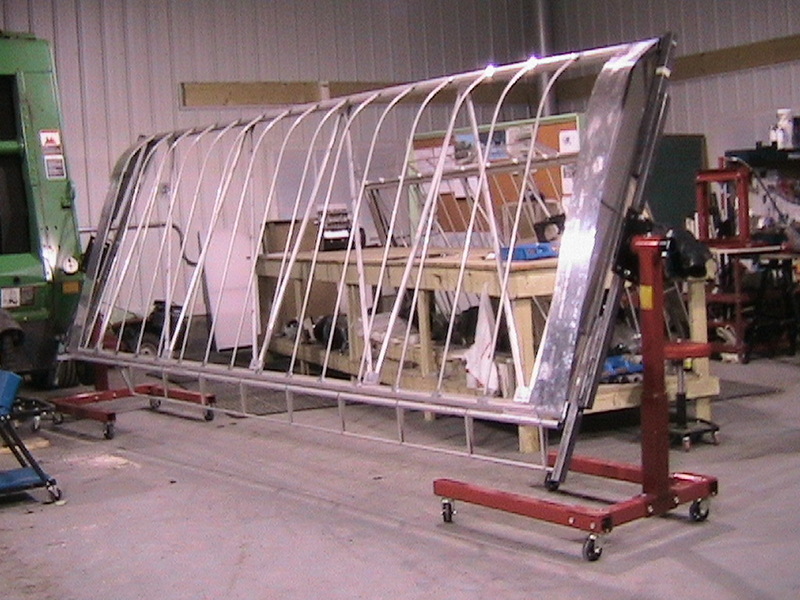 We are finally moving on to the fuselage! India-Lima-Hotel-Charlie is getting into the air soon!! My advice now that my wings have been sitting around for a while getting dusty - don't fabric until you're ready to fabric everything and get at least your first coat of Polybrush on. Tack clothes and MEC will take the dust off, but it is a lot of hours to get things clean. 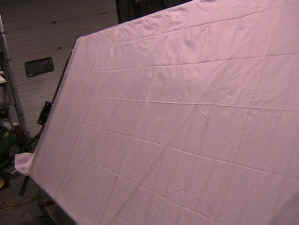 If you must fabric, be sure to wrap everything up nice and snug in poly to keep the dirt off. Ideas, illustrations and photos are the author's own work and are for information only. Builders of Challengers should always follow the Quad City manual.